As human beings, we all walk around with a bunch of stories in our heads that we have made up over time about ourselves, others, and the world. As such, we experience almost everything that happens to us through our own lens of interpretation and then call it objective reality. Here’s a personal example of how this notion plays out. When we first opened our studio, some of our guests came to meditate and then didn’t come back. At the time, we took it to mean that they didn’t think our service was good enough. But that’s not what actually happened. All that happened is that they just didn’t come back for a bunch of reasons that they made up too. Full stop. End of story. We went ahead and made up a story as to why, without even asking them. 19 months later, we know that when someone doesn’t come back to our studio, it doesn’t mean that they don’t think our service is good enough! Now explore this for yourself in the context of your own life…. When your friend says that they are too busy to see you on the weekend, what do you take it to mean? Perhaps you take it to mean that you aren’t important to them. Consider that ‘too busy’ just means that there are lots of different things that can occupy our time at any given moment, and we choose to do some things over others. Your friend chose to do something else instead of seeing you. It doesn’t mean that you aren’t important to them, just ask them yourself! When you ask your partner if they want to go to a cafe on the other side of town and they tell you it’s too far, what do you take it to mean? Perhaps you take it to mean that they don’t love you enough otherwise they’d do it. Consider that ‘too far’ just means that there are places that exist in various locations that are at various distances from each other and it takes more time to get to places that are further away. Your partner would prefer to spend his/her time on something other than travelling the distance it takes to get to that particular cafe. It doesn’t mean they don’t love you enough, just ask them yourself! At some stage you might have thought that meditation is too hard. Consider though whether there actually is such thing though as objectively being ‘too hard’? Perhaps ‘too hard’ just means that there are some things you can do and some things you can’t. For instance, humans can’t fly. This doesn’t mean flying is too hard, since birds fly effortlessly all the time. It just means humans can’t fly. 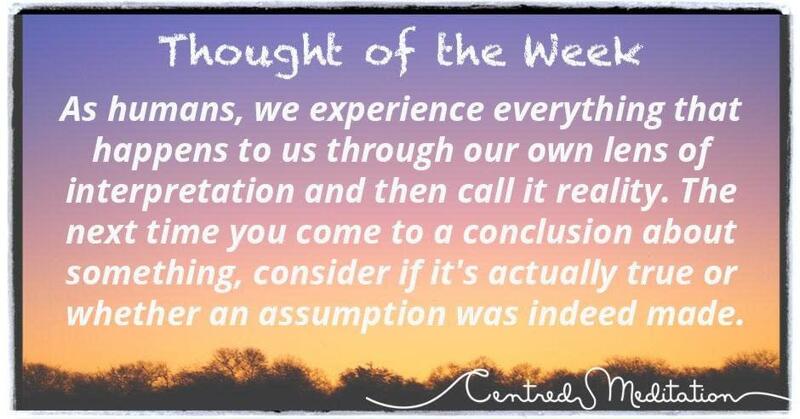 Perhaps what you really believed was that you couldn’t meditate, not that meditation is simply too hard for you. (Just so you know though, no-one can’t meditate. All humans can bring their attention to something and then when they realise their attention has gone off it, bring their attention back to it… so perhaps you were just misinformed on what it meant to meditate in the first place, just ask us). So the next time you think something, consider whether the conclusion you came to is actually based in objective reality or not. And remember, when in doubt, just ask!